Japanese and Buckwheat Noodle Restaurant, "Zougura"
"Zougura" is a Japanese restaurant in the Zougura storehouse that was built in 1898. Here, we serve sake and local beer that can only be enjoyed in the brewery, seasonal food, tempura, and handmade buckwheat noodles. On the second floor, we run a historical museum, and display material including articles concerning the history of Ishikawa Brewery, our sake and beer making (no admission charge). Wed.Thu. are closed. Every other Friday, the restaurant opens at 5pm. 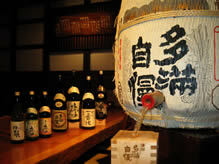 Our party room or hall in the old kura building of Mukougura is available for parties. Inquire for details. □Click here to see "Menu" of Zougura.